Experience the best of the laid-back Southern California coastal lifestyle at this lovely resort. With an idyllic setting along the sunny Pacific Coast in northern San Diego, the Cape Rey Carlsbad is a haven of relaxation. Located just across the street from Carlsbad State Beach, the resort offers uninterrupted views of Southern California's dazzling sunsets. Bright, airy guest rooms and suites bring the outdoors in, and provide plush amenities for your comfort. Many rooms feature ocean views and balconies. 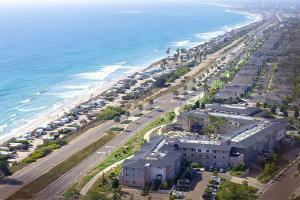 Located just 30 miles from the San Diego International-Lindbergh Field. Chandler's Restaurant - Coastal Regional Cuisine; Chandler's Lounge - Bar. Carlsbad State Beach, Legoland, Ponto Beach Carlsbad, San Diego Zoo, Sea World.